It's about 1965, to judge from the hairstyles and the weight of certain participants. I think it's from a TV show... certainly not live. Although its all over the later Marksmen records, David never like the guitar...he said it was hard to play and he was disappointed it wasn't like George's. He sold it for what he paid for it some time in the late 60's...but not before his father engraved his name on the backside of the serial plate. Years later, after he realized how rare a guitar it was, he looked for it and heard rumors about a collector in Santa Barbara who had it. Another 10 years or so went by and David met Jeff Foskett and it turns out, Jeff was the collector in Santa Barbara that had it...he'd picked it up in the 80's when he was in the Beach Boys. David offered Jeff 10 grand for it on the spot...he paused slightly and then said No. As far as I know, Jeff still has it. 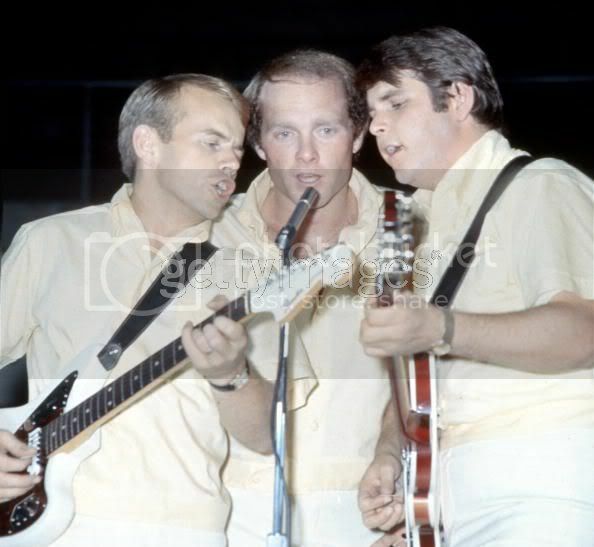 Carrie - I checked with Bjorn Erikson, and he said that there was an extremely small number of original 360/12s (less than 5 certainly) made in the '64 timeframe with an f-hole, so David's guitar may have been one of the rarest of them all. If the guitar had two output jacks (for the faux-stereo Rick-O-Sound effect) it was one of those 360/12s, otherwise it was a 330S/12 like Carl's which for some reason got 360 inlays. Either way, it's a rare bird. Carrie, great info! Was it true that Carl had suggested to Dave that he sell it? Interesting that Foskett has it.....maybe someday Dave can get it back. Thanks again for this info, how ironic is this? Wow. I asked David about the dual out-put jacks and his answer was, "Whoa, I forgot about that...yeah it did." So yes, it would seem it was one of those less-than-five-made 360/12's then. Thanks for doing the research...its great to get a little history on the guitar. How it ended up on the rack on Hawthorne Blvd is still a mystery, though! Unless Bjorn has that info...I'd be curious to know? No, Carl didn't have any role in him selling the Ricky...I asked him - it was '73 when he let it go, so he hadn't been in touch with Carl for a few years at that point. Besides, I think Carl would have known its value, at the very least...if he couldn't convince David to keep it, he probably would have bought it himself. As far as getting it back, Jeff has been a really great friend and David is happy for it to reside with him! Carrie, thanks again for the insight and I guess there is a bit of a happy ending - as you said, if Dave doesn't have it, at least he knows where it is and maybe Jeff will allow him visitations, LOL. Sorry I missed this until now! Very good work everybody--this is exactly the kind of thing I'd like to get into more, figuring out more exact equipment info, even for session guys too. Now, everybody get to work so we can finally figure out what the two 12-strings were on the WIBN intro. Does anybody know anything about the gold colored Fender Stratocaster that Carl sometimes played? What year was the guitar? Did he play more than one? I always thought that the WIBN intro was a harp. This according to BehindTheSounds' Youtube video for WIBN: "Barney Kessel probably isn't using a standard 12-string guitar for this session, but rather a custom built instrument- a mandolin body attached to a 12-string guitar neck". Do you mean "Ol' yeller" ? The one you can see during the Knebworth-concert? Later scholarship has disproved this. "He had the first production model 'Olympic White' Fender Stratocaster. He called it 'Old Yeller' when the color faded over time." a mandolin body attached to a 12-string guitar neck". Sounds a little like a 12-string bouzouki. 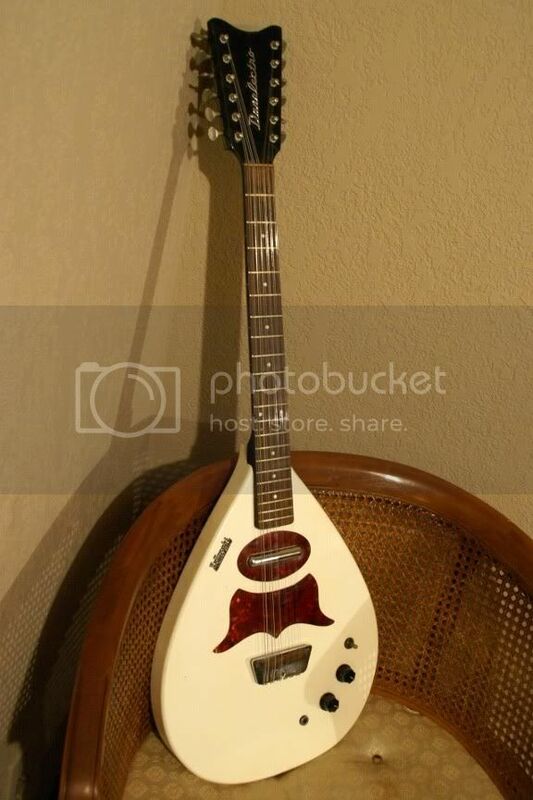 Quite possible that it was a Bellzouki - an early electric 12 from Danelectro (the one that resembled a mandolin was the single-pickup model 7010; the 7020 with 2 pickups had a pointier body). The 7010 came out as early as '61, and IIRC, Tommy Tedesco owned one, so it's plausible that Kessel owned one or used Tedesco's at a Wrecking Crew session. The Bellzouki is supposedly heard on the theme from "Bonanza" and Jackie DeShannon's original version of "When You Walk In The Room" (played by Glen Campbell). The Bellzouki was designed by NY session guitar player Vinnie Bell (who also designed the Coral electric sitar - the body of the Coral instrument looks to be a slightly refined version of the 7020 Bellzouki - no surprise, since Danelectro and Coral were under the same corporate umbrella). Put a bit of compression on a Bellzouki through a Fender Deluxe and turn up the 'verb, and I think you'd come very close to the WIBN intro sound. Getty Images probably doesn't allow hotlinking, so I just copied it to my Photobucket account. Thanks. Did you get the second picture as well? I've considered that it might have been the bellzouki. That could explain some of the confusion that has arisen, I suppose. What really should be done is a test, somebody should get various instruments and try 'em, make a 12-string mandolin hybrid and try it, etc. 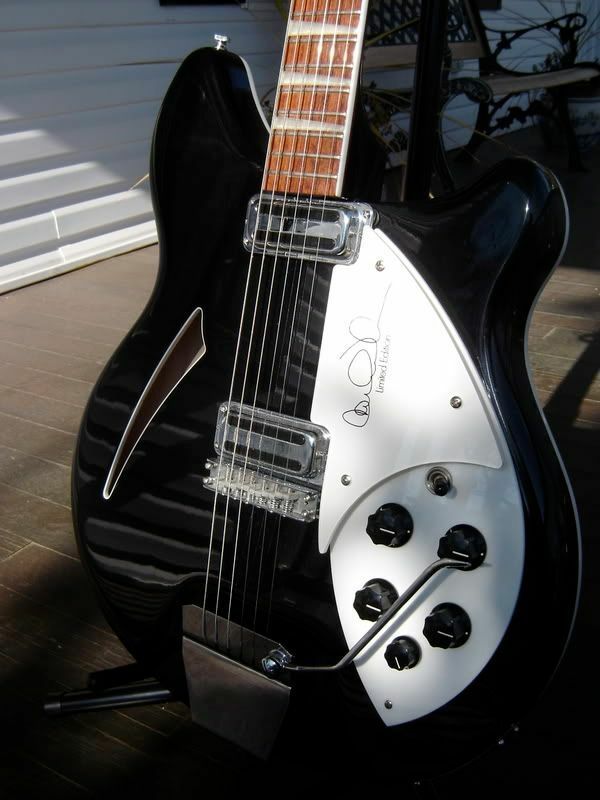 The only other possibility that occurs to me that Kessel might've used is a Vox Mando-guitar, which was used by George Harrison and Brian Jones on various recordings (Some web pages assert hearing one of these on the Beatles' recordings of "Words Of Love", which I'd totally discount - that's a Gretsch Tennessean and a Gibson J-160E, and "Girl", which I'm pretty sure is a capoed acoustic; I'd be more inclined to believe hearing the Mando-guitar on the Magical Mystery Tour album - perhaps on "Baby You're A Rich Man". Brian Jones supposedly used the Mando-guitar on "Mother's Little Helper" and "Get Off My Cloud"). I would think it's a Vox Mando on the Fabs' "It's Only Love". Stones-wise, I'd say "Mother's Little Helper". Whatever instrument is playing the main Intro line on "WIBN", it's definitely Barney Kessel and it's definitley a kind of guitar, according to BW himself. In the premier issue of the official BW fan newsletter "Break Away" (Summer 1996), Brian answered a fan question on what instrument starts the song, and he replied "It's two guitars - one played high up on the neck and the other one played regular". In the Fall 1997 issue of "Break Away", he's quoted as saying Kesel's guitar on "WIBN" "brought a kind of ring-a-ding sound". Maybe that's all it is...two Fender 12s, or maybe a Ric/Fender duet. If it IS a Bellzouki, they obviously had to add tons of reverb to compensate for that instrument's inherent lack of sustain. Isn't a Bellzouki used on Simon & Garfunkel's "Sound Of Silence" (the overdubbed "electric" hit single version)? I'd say on "It's Only Love" John is playing a 12-string acoustic capoed up high, probably the Framus 12 you see him with in the scene in "Help" playing "You've Got To Hide Your Love Away". George is likely using the Tenny or a Strat to get that nasal tone with plenty of warble on the vibrato arm. I don't hear the Mando on it at all. Can't really think of the Fabs using the Mando on the "Help!" album - "Rubber Soul", very possibly, but "Help!" was more them playing with their new Strats. I would definitely agree with you on "Mother's Little Helper". Powered by SMF 1.1.21 | SMF © 2015, Simple Machines Page created in 0.378 seconds with 21 queries.